The highest-ever number of restaurants closed in London in the last 12 months. That’s the conclusion of the 28th edition of Harden’s London Restaurants and its equivalent apps, published on 8th November, which record 117 closures: the highest since the guide commenced publication in 1991 (the previous high was 113 in calendar 2003). There were 167 restaurant openings: the fourth-highest year on record (the record of 200 took place two years ago). 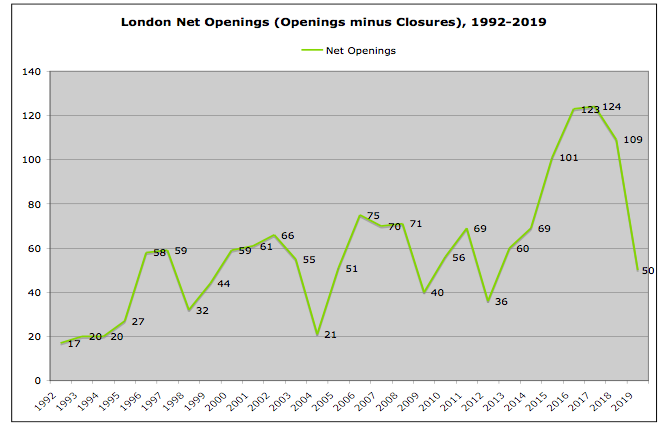 Net openings (that is Openings minus Closures) of 50 (167-117) were down by 50% on the previous year’s figure of 109 (193-84). Viewed on a graph of net openings, a five-year peak has passed, with net openings back in the range (of 40-75) that encompassed most previous years from the mid-1990s onwards. A further sign of pressure in the independent market comes from the ratio of openings to closings (i.e. “churn”) which dropped sharply to 1.4:1. 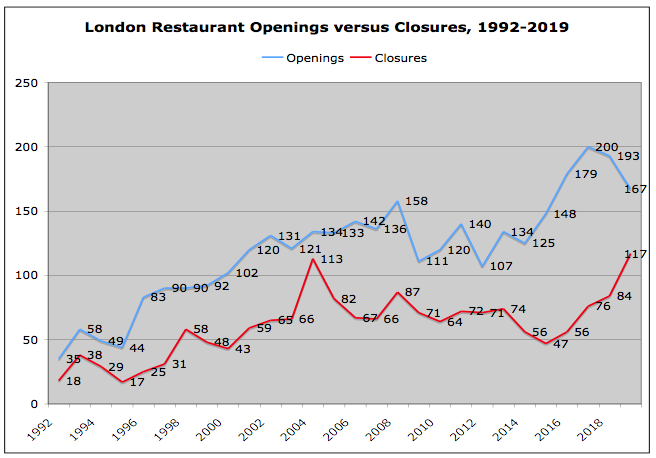 Only one previous year has exceded this rate: 2003 when, at 1.2:1, it was a time when for nearly every restaurant that opened another one closed. The guide’s statistics are skewed to independent restaurants, and – although the guide does award ratings to restaurant groups – chains with more than three branches are excluded from the openings and closures statistics it publishes. If the effects of well-publicised closures in large chains such as Jamie’s Italian and Byron were included it would make the picture presented by the statistics even more dramatic. “It used to be the case that good restaurants as a rule did not close. 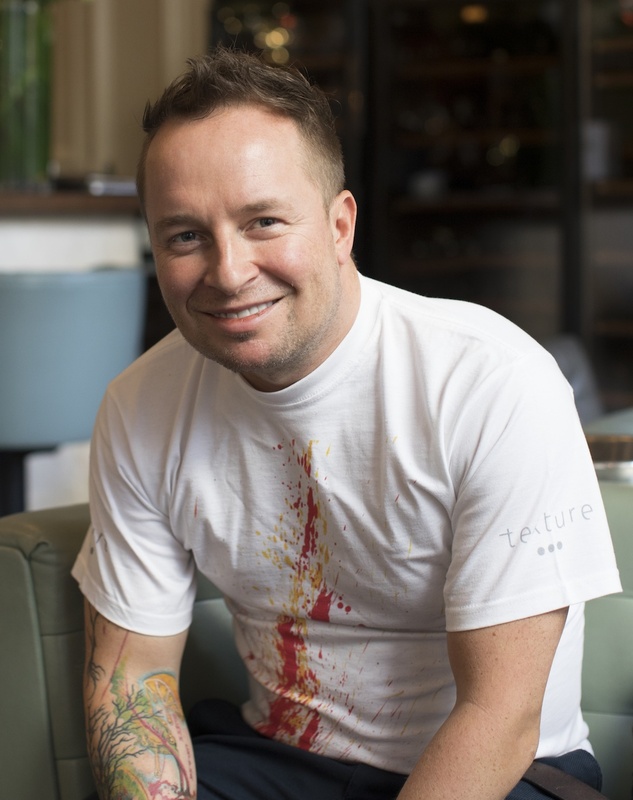 But the last year has seen losses at the top end such as Marianne, landmarks such as The Gay Hussar, and highly-rated start-ups like Killer Tomato, which should have been a success story, but which came and went almost as quickly as it began. The level of competition within the London restaurant market is unprecedented and is creating business conditions even more challenging that elsewhere in the UK. In 2003, the previous peak for closures, it was different: the hit to the market came from a slump in demand due to the second Gulf War, SARS, and the lowest hotel occupancy rates of recent decades. This time, the problem is purely and simply a case of over-supply: too many restaurants chasing a level of demand that although it continues to rise is doing so only slowly. Ratings and reviews in the guide are based on one of the UK’s most detailed annual polls of restaurant-goers, with some 8,000 people contributing 50,000 reports for the 2019 edition. • Texture Aggi Sverrisson’s “more-than-first-class” venture. In a year that has seen him put his 28/50 chain up for sale, his focus on this, his flagship, earned him the highest food scores in the survey, bar none! • Brat Chef Tomos Parry (ex-head-chef of Kitty Fishers) “exceeds high expectations” and has a smash hit on his hands, with this “terrific” launch – the survey’s highest rated newcomer. • Jamie Oliver His Jamie’s Italian chain received another dire scorecard (“awful, just awful”). Noting that this is the sixth year this has been the case the guide queries why it has taken media fooderati like Marina O’Loughlin in The Sunday Times so long to comment on the fact that the emperor isn’t wearing any clothes (bringing new meaning to the name ‘Naked Chef’!). • The Ivy chain spin-offs: For the first time Richard Caring’s spin-off chain heads the guide’s list of disappointments although this is partly a result of its growing footprint in the capital. On the overall concept, reporters are split. For a majority The Ivy name gives “a certain dignity to the experience”. For a significant number though, “the brand is being trashed” with these “pretentious, unimaginative, chichi and average” imitations. •The River Café Yet again voted London’s most overpriced restaurant. Most reporters are inclined to be forgiving: they “love the place despite the absurd cost”, but a sizable minority “know all the arguments as to why the place is worth it… but don’t agree”. Unless you include chicken shops, the shift away from meat-based formulae continued for a second year, with too many cuisines to list ranking higher in the openings list than those with a primarily steak-led or burger-led offering. In fact – highlighting the increasing popularity of veganism and all things plant-based – purely vegetarian openings were as numerous this year as for those two red meat categories combined. Modern British and Italian cuisines remain the most popular for launching a new restaurant, but Japanese newcomers made a stronger showing this year to be the third-most-represented cuisine for new arrivals. After Central London (with 65), North London (30) was for the first time the hottest point of the compass for new openings, just ahead of East London (29). The strength of North London openings however is largely accounted for by debuts in the hipster hinterlands of N1, which accounted for just over half of North London openings. So although the restaurant frontier has shifted slightly to the north, the hipster-heavy areas of East and inner North London remain the restaurant hot zone for the time being. South London only performed marginally less strongly than the other non-central areas (with 27 launches). Yet another particularly dismal performance from West London – historically the strongest point of the compass – yet again made it the least interesting area (with just 16 openings). The average price of dinner for one at establishments listed in this guide is £55.76 (compared to £53.20 last year). Prices have risen by 4.8% in the past 12 months (up on 3.6% in the preceding 12 months). This rate compares with a general annual inflation rate of 2.4% for the 12 months to August 2018, yet further accelerating the trend seen in the last two years by which restaurant bills have seen price rises running significantly higher than inflation generally.